It was morning, March 18, 1912. The city of San Antonio, Texas was awakening to a new day. On the East side of the city at 320 Milam Street, Mrs. Ellen Howard was walking towards the front of her house to get her mail. Mrs. August Peters of 1217 North Hackberry was standing in her yard. Mrs. A.P. McCall was walking across the yard of her residence on Mesquite Street. Mrs. E. O. Stephens at 115 Duval and Mrs. B.S. Gillis who resided in a large house at the corner of Mason and Austin streets, were both attending to morning chores in their respective homes. Several blocks away, just outside of the Southern Pacific Roundhouse, near present day Interstate 35 and Austin Street, locomotive No.704, a modern "ten-wheeler" passenger engine of the Galveston, Harrisburg and San Antonio Railroad was being prepared for regular service. The engine had been involved in a train wreck in Seguin on December 18th, 1911 and the repairs had just been completed. As No.704 was needed for a run that evening, the order had been to "warm er up". Walter Jourdan, the engineer, an old hand and the most experienced trainman in the yard was moving in and around the locomotive making adjustments, checking fittings and generally preparing for movement out of the yard. Jose E. Fuentes, a shop painter, was painting a star insignia on the side of the engines driving rod. Scores of men were working in the shops located to either side of the locomotive. Among these were Archie Price, a pipefitters helper, and P.J. Stoudt, a workman in the cooper shop. Henry C. Mansker Sr, foreman of the Blacksmiths shop and his son James, a machinist, were standing within yards of each other. Robert Mantiel, a machinists helper was near the locomotive itself. The clock in the Machine shop indicated 8:55 AM. It would never reach 8:56. Work at the railroad yard had not been all that pleasant recently. Labor problems had developed and a number of the boiler repairmen, copper fitters and other craftsmen necessary for the servicing of the large locomotives had been replaced since a walkout in the Fall of 1911. The Assistant Roundhouse Foreman, James Valentine, was openly carrying a pistol. Most of the men working in the blacksmiths and machine shops within and near the roundhouse that morning, were new to the yard and to San Antonio. Several were recent arrivals from Pennsylvania, Ohio and New Jersey, while others were from towns in various parts of Texas. All had been brought in to replace long term employees that had stopped working, walked off the job, or been fired. Many of the men had been brought in so recently that they had yet to draw one pay check, their names were not recorded, many were working under assumed names and even the exact number of men in the yard was not known. The Galveston, Harrisburg and San Antonio Railroad, as well as the parent Southern Pacific, was determined to keep service on time. No.704 had been tested the previous day and appeared serviceable. On this morning of the 18th the pressure valves had indicated a possible problem and the initial firing of the boiler had been stopped and the pressure allowed to drop. The boiler was then refired and the pressure was allowed to build a second time for the run out of the yard. Everything appeared normal and No.704 sat idling on the track, partially out of the roundhouse. It was at this point that the iron reinforcing bars supporting the "crown plate" of the boiler failed and the pressure was suddenly and catastrophically released. In the space of an instant, the boiler began to split along its bottom. As the steam found an exit, the split widened, pushing and bending the walls of the cylinder outward, snapping the great wheels from their hubs, breaking the boiler from its carriage and launching the multi-ton cylinder skyward. Accompanying it were hundreds of pieces of engine accouterments, pipes, levers, rods, plate iron, grates, etc. The pressure wave, moving outward from what had been the engine then struck the shops filled with working men. Buildings, structures and people on the ground in the immediate area of the engine were blown to pieces or if closer to the engine, simply disintegrated. As the pressure wave moved outward it carried away heavy equipment and structure walls causing the building roofs to collapse. This surface wave, carrying iron parts, splintered wood, human body parts and other debris, continued outwards from the railroad yard and through the surrounding neighborhoods, uprooting trees, snapping limbs, blasting out windows, and punching holes in residences. Mrs. Peters, while standing at her gate was struck by an iron bolt, knocked unconscious and suffered internal injuries. Another homeowner, W. H. Witer, felt the crash of an object punching a hole in his house and upon investigation was horrified to find an entire human arm embedded in a rafter. Mrs. McCall stood, transfixed, as first, a mangled portion of a human corpse landed in her yard and then one of No.704s auxiliary air tanks smashed down almost at her feet. A portion of the crown plate that passed through a home. 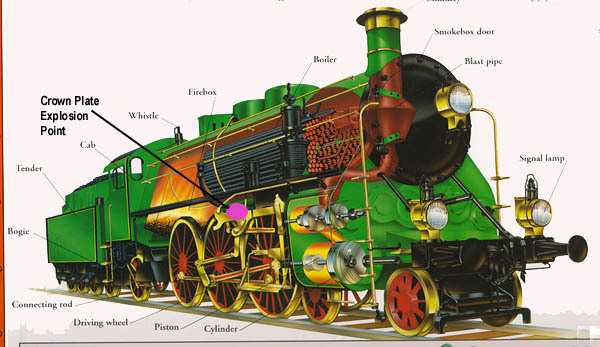 The locomotive boiler and its accompanying equipment, meanwhile had continued to travel upward, being propelled and torn asunder in mid-air by the venting steam. As the pressure finally abated, the pieces, many weighing thousands of pounds, began their individual fall to earth. For blocks in every direction, just as the surface wave passed carrying its debris, the air became filled with falling iron shrapnel, engine parts and human pulp from those unfortunates in the vicinity of the locomotive. Mrs. Howard, had just left the rear of the house when a falling portion of the crown plate, weighing several thousand pounds, tore away the rear section of the house before burying itself into the ground. 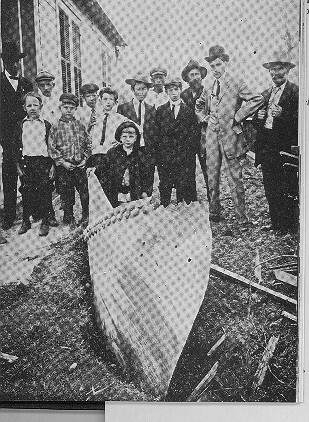 A 15,000 pound piece of engine casing which landed over a quarter mile from the point of explosion. Mrs. Gillis was at her home located nearly seven blocks from the roundhouse when the entire front end of locomotive No.704 began its decent to earth. The mass of iron struck the roof of the Gillis residence and continued through into the ground, crushing what was not shattered. The entire structure was destroyed. Mrs. Gillis injuries were considered terminal. Mrs. Stephens was severely injured when one end of her house was reduced to splinters as a portion of the engines water jacket passed through. 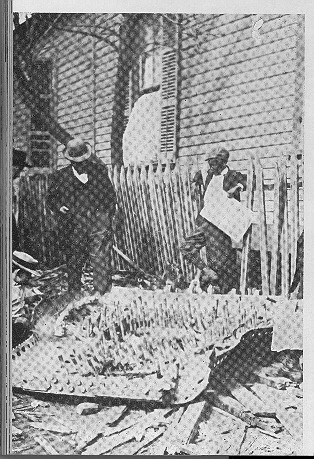 The transom of a home on River Avenue(now Broadway) was blown out. The pressure wave of the explosion continued outwards, the effects dissipating with distance from its epicenter. As the wave reached the far West side of the city, miles away, it still retained enough strength to rock buildings, giving the impression of a gas explosion or earthquake and causing people to flee their homes. As the blast subsided, thousands of people, wherever their location in the city looked towards the Southern Pacific yards where an immense black cloud was moving upwards. The US Army at Fort Sam Houston responded immediately. Military ambulances began moving towards the yard and a detachment of cavalry was sent to maintain order. City of San Antonio police and fire personnel began to arrive. The first to reach the yard had their hands full. The North and South Walls of the blacksmith and machine shops as well as the Southwest portion of the roundhouse had been blown to atoms. A third of all the heavy machinery in those shops was either no longer present or was a twisted mass of wreckage. No structure or machine which had stood within a 100 foot radius of No.704 existed. 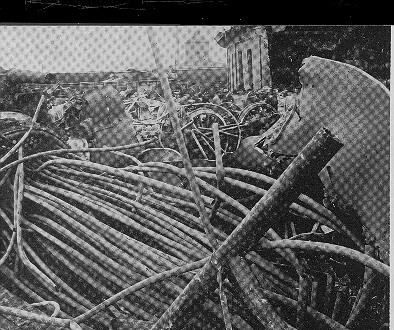 The cooper works, and all the attendant machinery was destroyed. As the walls were blown away, the roofs of the blacksmith and machine shops had collapsed onto the working men. An oil tender, directly behind locomotive No.704, had been thrown end over end for almost 150 feet spraying hundred of gallons of oil over the broken, twisted debris before coming to rest against another locomotive. This oil coating almost immediately caught fire. Those men who had survived the blast, falling buildings and flying iron, injured and trapped under the collapsed buildings and debris were now in danger of being burned alive. The boiler tubing is in the foreground, the drive wheels and lower portion of the engine behind, with the southwest portion of the roundhouse beyond. While the fire was being fought, the military medical corpsmen and civilian ambulance personnel, police officers and arriving railroad workers began the long tedious job of locating and in many cases, freeing, the injured men. P.J. Stoudt and two other workers had been blown under a heavy workbench which had held its form when the roof collapsed, saving their lives. James Mansker regained consciousness laying in the wreckage of the machine shop and although injured began looking for his father. He found the elder Mansker dead in the ruins of the blacksmith shop and took his fathers body home. Archie Price had also been killed, his body would later be identified and claimed at one of the local undertakers morgues. Robert Montiel and Jose Fuentes, no longer existed in any recognizable form. The body of James Valentine, the Assistant Roundhouse Foreman was identified by the pistol that he carried. The body of Walter Jourdan the engineer of No. 704 was found in the yard and with some difficulty identified. Regardless of their individual trauma, both the living and the dead were covered with heavy black oil, their flesh embedded with bits of coal and wood splinters. At least six doctors arrived on the scene and provided initial treatment. The injured were then placed in the horse drawn ambulances and taken to Santa Rosa Infirmary. Three other locomotives in the roadhouse had been heavily damaged. One had its whistle bent open and the entire rescue operation had to be conducted under its continued, full throated scream which lasted for over two hours, until the pressure subsided and the noise slowly, eerily died away. With the fire under control and the injured carried away, the dead began to be collected. The task was grisly. Almost no body was whole. Most were not recognizable. Body parts were strewn for blocks. Teams were dispatched to walk the residential areas. These two-man teams carried a basket between them covered with a white cloth for collecting the human viscera and body parts laying on the streets and long poles to knock down the pieces hanging from the power lines, poles and trees. The wife of Carl Cisko, a blacksmith, arrived at the yard and after finding that her husband was dead, simply sat down in front of a nearby store, cradling one of her children and sobbed uncontrollably. Recently arrived in town and speaking no English, she had nothing but the few days pay her dead husband was owed by the railroad to support herself and two children. As the dead were taken to the morgues and the injured to the hospital, the scope of the disaster began to take shape. 26 men were known dead, more than 40 men injured in the yard itself. An exact number of citizens injured or killed was never collected. As many of the strikebreakers were working under assumed names and were from out of town, it will never be known exactly how many were killed. 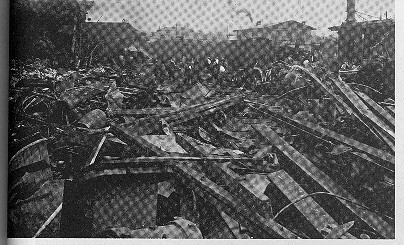 The Southern Pacific Railroad also moved several of the severely injured to the company hospital in Houston within days of the explosion and their fate was never reported locally. Due to the mangled condition of the bodies, local family members either made a decision to identify and claim a particular portion of a corpse or accepted that their loved one had simply disappeared in the explosion. After a few days, the morgues buried what remained. The mass and weight of human viscera and body parts would indicate that at least ten more men were thereby accounted for. The most accurate estimate of those killed would seem to be no less that 26, probably no more than 40. The injured numbered upwards of 50, including non-railroad persons. The most conservative estimate of the immediate monetary loss, of about a quarter million(1912)dollars, with total losses of approximately three quarters of a million dollars did not include collateral damage to the neighborhood.6 A total accounting was never attempted.